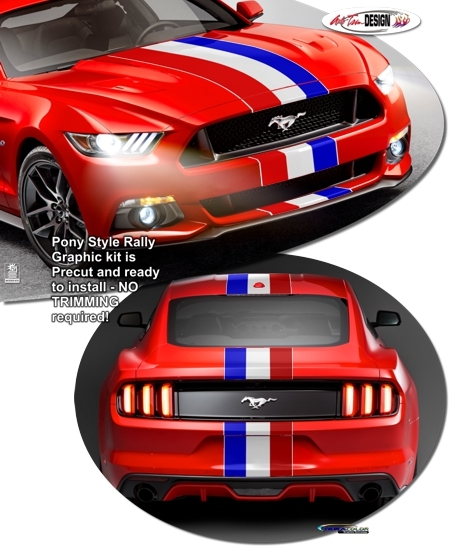 Make your '15-Current Ford Mustang stand out with this great-looking Pony Style Rally Stripe Graphics kit. Uniquely stylized after the Red, White and Blue Mustang Pony Tri-Bar, kit is PRECUT and ready to install - NO TRIMMING required! Digitally printed with our DuraCOLOR graphic technology, kit is manufactured with premium automotive grade cast vinyl film materials in the classic Red, White and Blue with a slight 0.30" (7.62mm) outline at each outer edge. As a further step, graphic is covered with a Gloss or Matte 2 mil clear laminate which provides protection from miles of abuse. Trimmable Spoiler Kit (ATD-FRDMSTNGGRPH371) includes one (1) 16" (40.64cm) long piece that may be hand trimmed for custom spoiler applications.